A Northern Michigan native, Kim Diment’s art brings personality and life to the animals she portrays. Both her art and love for animals started at a young age. Her first preteen field sketches came from wanderings along the backwaters of the AuSable River during the spring thaw migrations. She drove her parents crazy with toads, frogs, turtles and orphaned animals she would bring home. Her brother ruined her high school social life by dubbing her “Nature Girl”. After High School Kim’s formal training involved a double major from Michigan State University in Zoology and in the Fine Arts. During her college years she was competing in the Michigan Duck Stamp Art Competition.She later went on to teach High School art for thirteen years while simultaneously pursuing her own art. In 2003 she started painting full time. Kim became addicted to travel in the mid eighties. She visited countries that were especially diverse in wildlife. It is no wonder Africa became her favorite. Her first trip was in 1992 and then her second in 1996. Since the second trip she has made a pilgrimage back practically every year since. 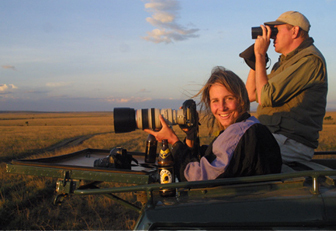 She has visited most of the southern countries of Africa but now is a more regular visitor to Kenya. Kim’s travels also include Ecuador, Belize, Canada, US, Europe, and New Zealand. Future travels will hopefully include Alaska, Northern Canada, India, the jungles and Australia. Kim loves her subject matter and tries to help out in preserving it when she can through several conservation projects. Currently she is involved with the on going project Tahquamenon State Park’s “Art for the Park”. Kim is using a landscape from Michigan’s Tahquamenon’s Falls area and portraying a native animal species. These canvas Giclee's can be obtained from the park by calling (906) 492-3415 or by directly contacting Kim. Past paintings include moose, bear, wolf and Spruce Grouse. The latest edition features the Bald Eagle. An edition of 125 prints is being made for each year’s scene. A portion of the sales go back into the State’s Park systems. Further away from home Kim is currently working with “Grevy’s Zebra Trust of Kenya” which is targeting the dwindling northern herds of Grevy’s Zebra. A series of paintings to help bring awareness and generate funds are underway. The first being completed last year called “Samburu Grevy’s” is still available for sale along with a set of limited edition canvas Giclees available from the St Louis Zoo and the artist. Kim has worked with Lewa Wildlife Conservancy in Kenya to raise awareness to the endangered species that are prevalent in that park. These include paintings of Grevy’s Zebra, Black Rhino and Cheetah. When these three paintings are sold a third of the asking price will be given to the endangered species program of Lewa dealing with habitat. Past projects closer to home include donations to "Ducks Unlimited" and “Trout Unlimited”, The Humane Societies of Iosco and Crawford County, local contributions to local Michigan Safari Club International chapters. Kim resides in northern Michigan on the Au Sable River with her husband Carl. Kim’s artwork and Carl’s fine furniture are showcased at their “River Works Studios” of Grayling, Michigan. She is also the co-owner of "Main Branch Gallery" in Grayling , MI. She may be contacted by phone at 989-344-1843 or by e-mail kimdiment@yahoo.com. Her website is www.kimdiment.com. Kim’s artwork is also featured on the Artist for Conservation website www.natureartists.com under Kim Diment. Her work will soon be showcased on the UK bird website www.birdingart.com Kim is a signature member of the Society of Animal Artists and a signature member of Artists for Conservation. Animals have always had a story to tell. One must know and understand them to comprehend these stories. Ancient man did and produced beautiful works of art on the cave walls of Lascaux millions of years ago. I choose to portray animals because I find them more beautiful, more fascinating and more symbolic than any other subject matter. I cannot comprehend a world without animals. *Juried into the “Art ofthe Animal Kingdom VIII, IX, XI, and XII” juried shows at the Bennington Center for Creative Arts, Bennington Vermont in the summers of 2003, 2004, 2006, 2007,2008,2009 and 2010. *Placed second in the 2007”Artist’s Magazine” 24th Annual Art Competition animal category. *Juried into the International “Society of Animal Artist’s, Art and the Animal” Exhibits 2007,2008 and 2009and 2010 winning the Stanley Meltzoff Award in 2007. *Finalist in the 2010 “Artist’s Magazine 27th Annual Art Competition and receiving recognition in “Competition Spotlight” March 2011 Issue. *Winner of the Editor's Choice Wildscape Artist of the Year 2007 Awards published in the European “Wildscapes” magazine 2007 summer issue. * Displayed in the International “2008 and 2010 Artist for Conservation Exhibit” at the Blauvelt Museum in New Jersey. *Exhibited in the “Paint the Parks “Top 100 and Mini 50 Art competitions for 2007 and 2008. *Placed first in the Michigan Duck stamp for 2001 with previous second placings in 2007, 2000 and 1995 with a third placing in 1996. *Placed second in the International "Wildcat Art 2001" small cat category. This show, depicting cats of the world, was held in Beverly Hills and Fresno California, July 2001. Two other cat paintings, not receiving awards, were also juried into this show. *Placed third in the 17th Annual Wyoming Conservation Stamp for 2000 open to artist of the US and held in Wyoming. *Feature artist at Gaylord Arts Council for May 2010. *Co exhibited at Charlevoix “Circle of the Arts” with fellow artist Todd Werner in a two month exhibit entitled “Africa” August and September 2009. *Feature Artist for "The American Birding Association" 2006 National Conference held in Bangor Maine. *Feature artist for Michigan Audubon April 2002. * Exhibited for the "Jesse Besser Museum" of Alpena Michigan. January - February 2001. *Interviewed, painted and displayed artwork on "The Michigan Magazine" PBS Television program April 13, 2002. *Displayed artwork and was interviewed for "The Michigan Out of Doors" TV program spring of 2001. *Interviewed on channel 7&4 News regarding my work at Lewa Wildlife Conservancy and the “Against the Clock” painting for the Grevy’s Zebra. Grevy's Zebra fundraising effort at Lewa Downs Conservancy in Kenya. Artwork showcasing the Grevy's Zebra. - Informational article about the Grevy's Zebra. Depicted the differences between the African zebras and talked about work in Kenya. Photos, information and artwork regarding helping to save the Grevy's Zebra. - An article entitled "Against the Clock" was written about work with the Grevy's Zebra. Provided 12 paintings and an artist statement for the feature artist segment of the summer issue of "Life in a Pond" - The article showcased a grouping of artworks that best represented Michigan animals that might live in or around a pond type setting.